Rather, it arrived in the office today. It arrived in Manila on March 28 then spent until April 4 making its way the 5 kilometres from the airport to Makati where the office is. Still, it is an anticipated read every two months and with postal times, it gives me a wargaming fix between the digital editions of Wargames, Soldiers and Strategy turning up. Also, in perfect timing, it arrived immediately before lunch, so it was sandwiches today, manageable in one hand and no dangling bits flicking chilli sauce everywhere and spotting magazine and shirt. Sandwiches also left one hand free. So, what is in this read? The issue starts off with a continued “fiery” discussion of the New Chronology of Egyptian Dynasties as well as the Jebel Barkal temple. Both these discussions have been moved to the SOA forum to keep relevance and stop us all hanging on for two months for the counter-arguments or the gracious folding of a position. Aaron Bell discusses the Battle of Thapsus between Caesar and the Pompeian forces there led by Scipio and Juba. While a battle I knew of, for some reason I had never really got around to reading about it in detail. Lunch stretched a little past the hour today. Of particular interest to me is David Kay’s use of 3D printing to produce 6mm accessories. Now that honourable number two son has a 3D printer and is printing Dystoptian War type vessels I may pay more attention that when he is telling me than in the past. 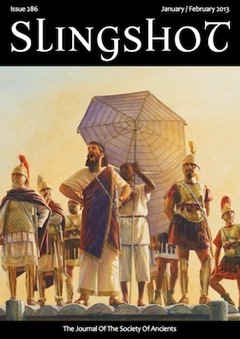 The refighting of the Battle of Arausio with DBA from Andy Offer was also interesting to me. Of a high interest as well is the item by Periklis Deligiannis in the Battle of the Kalka River. After a fair time living in Mongolia I still have an interest in Mongol goings on. I also have this battle at home in a board game which I have not even punched the counters on. I may get that down off the shelf this weekend – the article is tonight’s post dinner reading. If you are not a member of the Society of Ancients but have an interest in Ancient History and in particular wargaming, the Society’s membership fee is well worth the cost. Recommended. The only problem with the issues coming out so quickly at the moment? Instead of savouring the journal I’ll need to read it somewhat more quickly that I had planned. 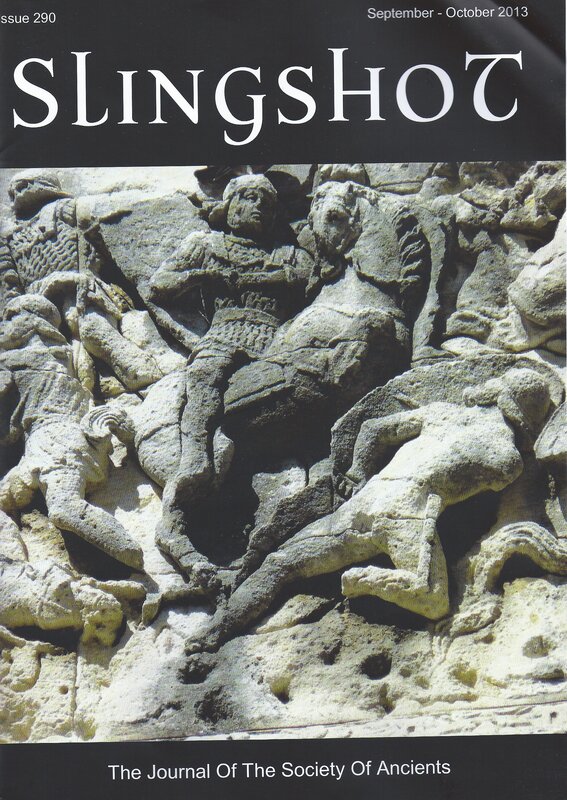 Slingshot, the journal of the Society of Ancients, arrived here in Singapore yesterday. A wonderful cover representing the arrival of Hanno the Great to hear the demands of the mutineers during the Libyan War of 240 BCE. The contents of the journal this time include Part 3 of “a Short History of the Iberian Peninsula from 400 to 1100 CE”, this part dealing with the Visigoths, a topic of interest to me. Also included is “The Western Mediterranean Way of Warfare Debates” a lively discussion of the Western Mediterranean. Nick Harbud presents a piece on building an army for a wargame, there is a continuation of a piece called Transjordanian Tales, discussing warfare and wargaming prospects around Moab in Biblical times. This has almost had me reaching for some chariots but no … elephants first! The rest of the journal is filled with pieces about some wargame competitions and such. As a whole, the journal is always worth a read and it is inevitably on top of the growing pile of reading next to me here. 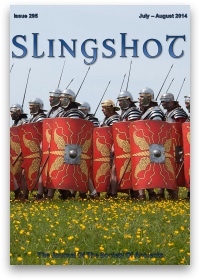 If you haven’t seen a Slingshot recently or have an interest in ancient warfare and wargames and haven’t seen a Slingshot at all, I can recommend this journal. It is colour throughout and for the £24.00 membership fee (Slingshot is free to members, 6 times a year) it is money well spent.